Panayiotis Zaphiris (male) is a Professor at the Department of Multimedia and Graphic Arts of the Cyprus University of Technology (CUT), member of the Cyprus Interaction Lab (CIL), and director of the Social Computing Research Centre (SCRC). 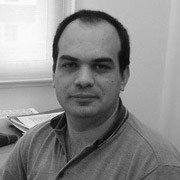 He is the co-founder of the Cyprus Interaction Lab, the first and only research lab in Cyprus specializing in the areas of Human Computer Interaction and Instructional Technology in Cyprus. His research interests lie in Human Computer Interaction with an emphasis on inclusive design and social aspects of computing. He is especially interested in Human Computer Interaction issues related to the analysis the design and the evaluation of interactive systems for the elderly and people with disabilities. He has managed numerous national and international research projects in these areas and he is now the project coordinator of the HORIZON 2020 Network for Social Computing Research (NOTRE) project. Panayiotis is also interested in internet related research (web usability, mathematical modelling of browsing behaviour in hierarchical online information systems, online communities, e-learning, web based digital libraries and finally social network analysis of online human-to-human interactions). Before returning to Cyprus he was a Reader at the Centre for Human-Computer Interaction Design , School of Informatics of City University London where he still hold the title of Honorary Senior Visiting Fellow. Before City University, he was a researcher at the Institute of Gerontology at Wayne State University from where he also got his Ph.D. in Human Computer Interaction (HCI) from the Industrial Engineering department. He also holds an MSc in Systems Engineering (from University of Maryland, College Park), a post-graduate diploma in Academic Practice (from City University, London) and a BSc in Electrical Engineering (from University of Maryland, College Park) and a Engineering Diploma from the Higher Technical Institute, Cyprus. He has published over 200 papers in high profile journals (e.g. ACM TOCHI, International Journal of HCI, Interacting with computers, Behaviour and Information Technology, Computers in Human Behaviour) and conferences (ACM CHI, INTERACT). He has also served as the editor of 17 edited books and 7 special editions of journals. He currently serves on the editorial board of the Universal Access in Information Society journal and as a reviewer for most of the HCI journals and conferences.